A rather less well known snack from Cyprus that doesn't seem to make it to the tourist areas anywhere near as much as it should ! 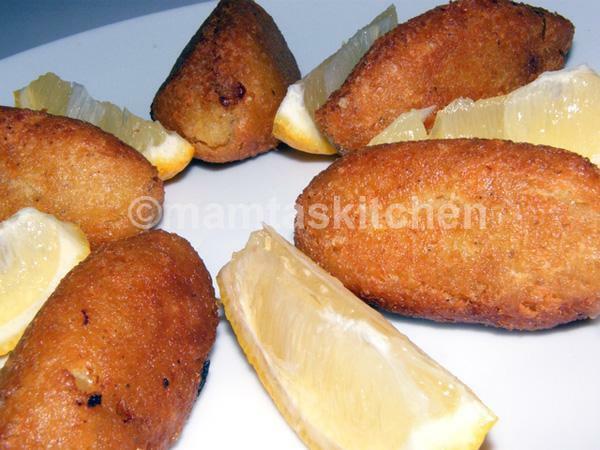 They are finger food, sometimes as part of a Meza, sometimes done for parties, but always served with fresh lemon slices ! They are a little tricky to get right and the more you do, the better you get! This version of mine uses a slightly adapted way of making them which does seem to make it a little easier. Makes about 20. 500 gm. Cracked Bulgar wheat (about 2 coffee mugs). Get the larger type used for salads. In a large bowl (as the bulgar wheat will more than double in size), put in the bulgar wheat, salt, pepper and top up with the hot water and cover the bowl. Leave for 60 minutes (give a stir halfway) until the water is absorbed and the wheat is at least doubled in size. Once cool add the eggs and then using a stick blender, mix and blend it all together. It should become into a thick paste, just like stiff humours. Put to one side. Heat a little olive oil in a pan and fry the pork mince on a medium heat, so its nice and broken down in the pan, not stuck in big lumps. Add the salt, pepper, oregano, garlic and mint and mix everything in. Add the diced onions and cook until they are nicely softened. You don't want too much moisture left in the pan. Toss in a big handful of chopped fresh parsley, mix and remove pan from the stove. Allow this to cool, because this it makes it easier to manage in the next part. You will need a nice, clear area with everything set out first, as it gets a little messy while you make them. You will need a bowl of water so you can use this to wet your hands. You will need a large plate or tray to put the rolled Koupes out on. Wet your hands and scoop out a little of the bulgar wheat mix, about a golf ball and a half sized. Then with the point into you hand towards your thumb, take a wet finger of the other hand and poke a hole into the middle of it. Work around opening up the hole a little and make it smooth, as in picture. Spoon in about 2 teaspoon of the filling, this should be enough, into the hole. Then squeeze the top of the ball shut and gently roll into shape again. It is slightly pointed at both ends. In a shallow frying pan on a high heat (not quite smoking but med-hot), gently place a few Koupes into the oil at a time. Allow them to brown, gently turning them until they are evenly browned. Remove with a slotted spatula and place on kitchen paper to drain. Don't try to eat them yet as you will burn, I know...! If you want to serve them warm you can keep them in a warm oven while you do the rest of the batches. Once they are all cooked, serve with a slice of lemon, so everyone can give a little squeeze of fresh lemon juice on top as they eat. These can be eaten cold as well and are therefore good for packed lunches and picnics. Practice makes perfect, don't expect to make them all exactly right the first time. I did mine for 2 nights on the run to get everything spot on. For the bulgar wheat coating, moisture is a problem. So make sure that you get rid of as much liquid as you can, before adding the egg and blending. If its too wet, you can't shape it in your hands. It just becomes a sticky mess, again I know! If you want the general taste of this, but are finding the making process hard work (please do try and practice as you will get it after a few goes), you can make the coating and the filling as described above but then just mix them together and roll into sausage shapes, deep fry (will go much darker due to meat being on the outside as well).